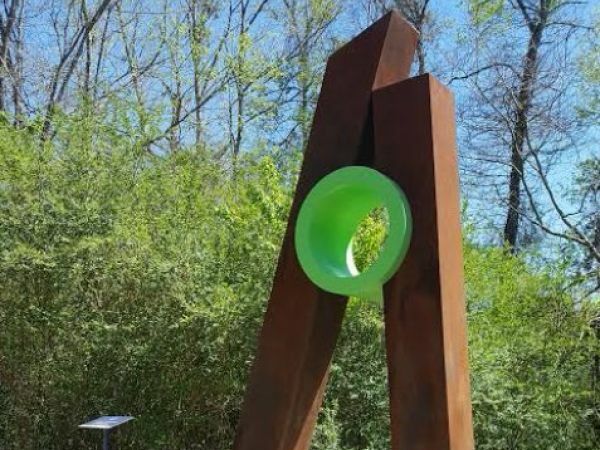 Closing our second year of the ArtAround Roswell Sculpture Tour, Roswell Arts Fund is thrilled to gift three sculptures to the City of Roswell. Reception, Sweet Pops of Brilliance, and Sentience will all remain permanently in Roswell thanks in part to generous donations by local businesses and residents.  Steady has also been purchased by The Hagan Family Foundation. The sculptures will join two other permanent pieces purchased from the 2016 ArtAround Roswell Sculpture Tour, Smoke in the Historic Roswell Square and Oak Leaf Triptych in Roswell Area Park. On Monday, January 22, Chair and Founder of Roswell Arts Fund presented the gifts to Mayor Lori Henry and the Roswell City Council. Positively Roswell captured the meeting in a live video on Facebook. Watch Rochelle present at about 14 minutes in. Reception welcomes visitors to the city of Roswell. 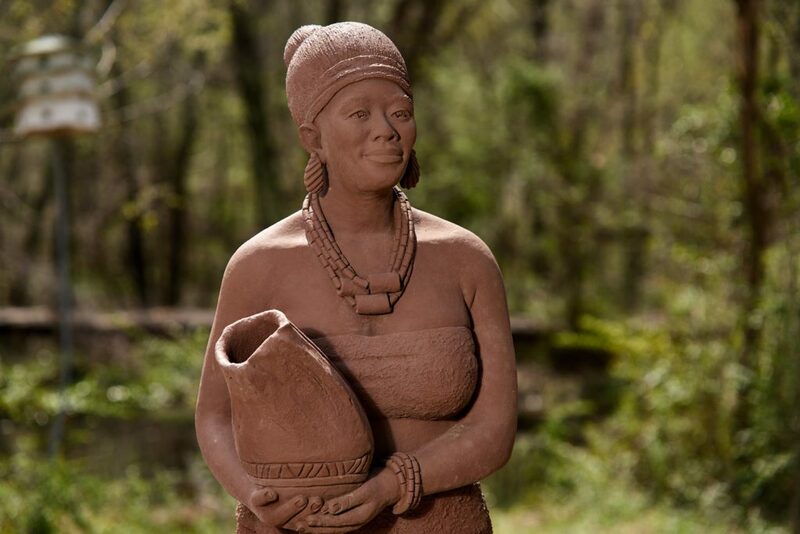 Reception, created by Nigerian artist Fred Ajanogha, is located at the Roswell Riverwalk near the Chattahoochee Nature Center and the border where Roswell meets Cobb County. Reception welcomes visitors to the city, fulfilling a Nigerian tradition that visitors should be greeted by the most beautiful woman within the house and offered a gift. The sculpture made of stone cast is of an African woman, dressed in traditional attire, holding a drinking gourd as a peace offering. Sweet Pops of Brilliance reminds people of their fun, happy memories. Sweet Pops of Brilliance by artist Craig Snyder features man-made materials forged into a whimsical form, then infused with bright primary shades. The sculpture is made from various types of rolled and forged steel and hand-painted with bright patinas. This piece was created to remind people of their fun, happy memories with family and friends. Fittingly, it remains in East Roswell Park, near the lake, fields, paths and Recreation Center where these happy memories are made everyday. Steady’s purposeful design invites participation and photo ops. 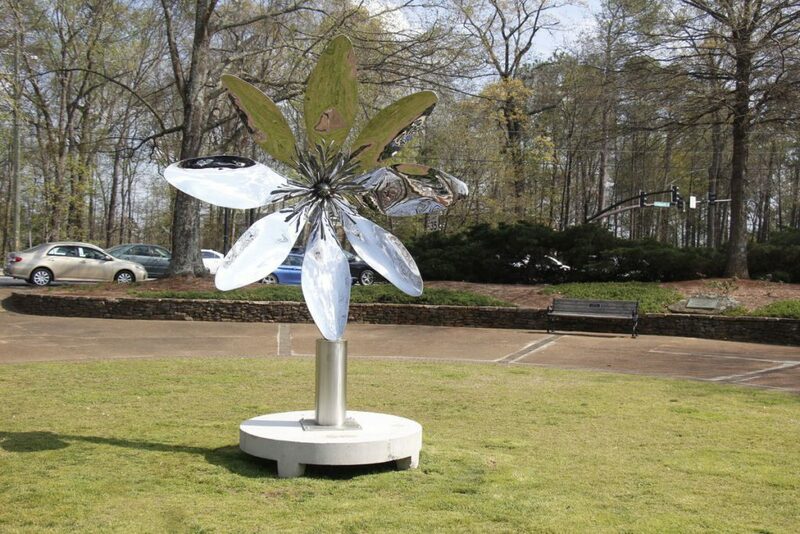 Ben Pierce’s sculpture Steady will also remain permanently in Roswell, as a purchase of the Hagan Family Foundation. 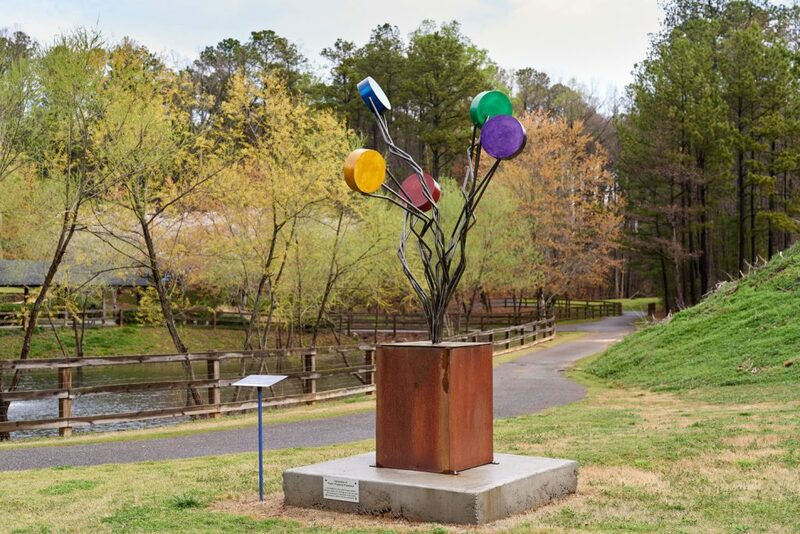 Steady will be on loan to the City of Roswell for the ArtAround Roswell 2018 tour and remain in its current location at Riverside Park at the East Trail entrance through early 2019. Steady is installed in one of the few sites which is visible to vehicle, pedestrian and bike traffic. From a distance its presence and simplicity provides a daily smile to commuters to and from work and play. Sentience by Atlanta-based artist David Landis will remain in the Heart of Roswell Park on Canton Street. This purchase was made possible in part by a $10,000 challenge grant issued by the Roswell Downtown Development Authority (Roswell DDA). Matching funds were raised via the Roswell Arts Fund’s Keep the Art! campaign which included the PartyAround Roswell gala event and donations from the local Roswell community. The Fund was established in September 2014 and was designated as the arts agency for the city in October 2015. It was created as a direct outcome of the Imagine Roswell Arts and Culture 2030 Study.